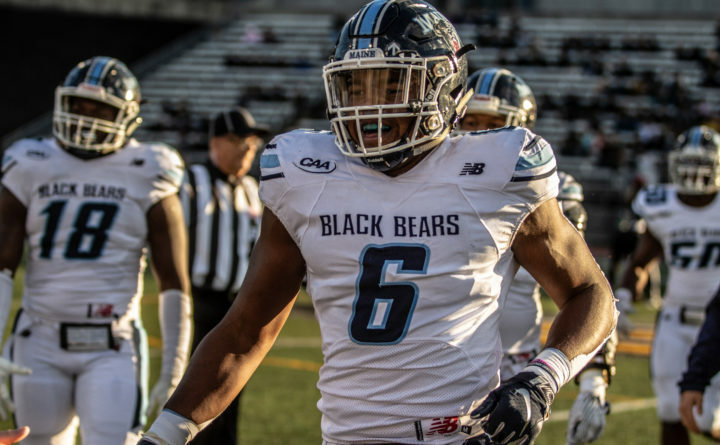 University of Maine senior linebacker Sterling Sheffield, who leads the Colonial Athletic Association in sacks with 8.5 and is tied for the lead in tackles-for-loss at 12, has been added to the Watch List for the STATS Football Championship Subdivision’s Buck Buchanan Award. The award goes to the top defensive player in FCS football. He is one of seven CAA players on the list along with James Madison cornerbacks Jimmy Moreland and Rashad Robinson, Delaware linebacker Troy Reeder and safety Nasir Adderley, Richmond tackle Andrew Clyde, and Elon linebacker Warren Messer. The 6-foot-2, 240-pound Sheffield, a native of Mullica Hill, New Jersey, is second on the team in tackles with 59 and is third in solo tackles with 34. He also has an two fumble recoveries, two forced fumbles, two pass breakups and an interception. His 8.5 sacks ranks him ninth nationally. He recovered a high snap in the end zone for a touchdown in a 27-20 loss at William and Mary. He has registered at least one tackle-for-loss and one sack in seven of UMaine’s nine games, and had double-figure tackles in UMaine’s games against Football Bowl Subdivision teams Western Kentucky (12) and Central Michigan (10). The University of Maine’s baseball team will play 14 games against NCAA Tournament teams this coming season including 11 nonconference contests. Included on the schedule, which the school announced Tuesday, is a 2018 College World Series participant, Mississippi State University. Schools Troy and Samford, and defending America East Tournament champ Hartford. UMaine will play a mutual season-opening four-game series Feb. 15-17 at Florida State, which went 43-19 a year ago but was eliminated in its own NCAA Regional, losing to Samford (7-6) and Mississippi State (3-2) in its first two games. UMaine will play its America East-opening doubleheader at Binghamton on March 23 and its home-opening twinbill against University of Maryland Baltimore County on April 6. The Black Bears finished at 20-34 a year ago, going 2-2 in the America East Tournament that it hosted at Mahaney Diamond in Orono. Nick Derba’s Black Bears will be looking for their first winning season since 2013.